Metroplex Arbor Care is one of the leading providers in Arlington, TX in diagnosing tree disease or sick trees. 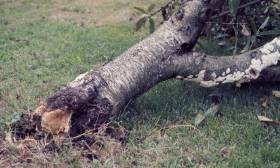 we have in-house tree Arborist that are specialist in evaluating your sick. We have been servicing DFW arbor care for well over 28 years and we also are the leading company when it comes to tree conservation in North Texas. It’s in the second nature of our company to do this professionally and formally educate you on your plantation. Leafs turning yellowy before fall? Tree bark splotching with black or white? Losing natural beauty in your trees? Common Tree Diseases in North Texas. Root Rot is not common in North Texas but does occur in some cases. Normally shaded trees fall victim to this Disease. The main cause is overwatering or fungi that penetrate open wounds within the root system and starts the decay the roots until the tree falls over. In most cases, if the tree is not too damaged it can be salvaged with simple tree injections or deep root fertilization injections. 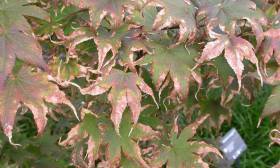 Leaf scorch is a common disease in North Texas and can be caused by several different factors. Underwater, tree plantation shock, nutrient deficiency, drought, or gardening injuries. Treatment after diagnosis is simple, fertilization of the soil or tree injection to put back the nutrients into the tree. Should see results within a matter of weeks from treatment from a certified arborist. 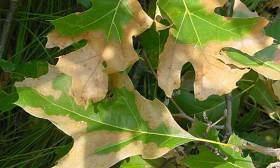 Oak Wilt is very common to Central and North Texas. This disease has taken the lives of more trees than any other disease in Texas history. Transmission is through a sap eating beetle that penetrates open wounds and lays its eggs causing disease. Treatment is not always simple depending on what stage the diseases is in. A tree can combat this disease through tree injections using pesticides with nutrients plus soil injections. Should see results in the next spring season. One of the many Fungi’s that attack North Texas trees is a simple breed of mushrooms that grow at the base of the tree. If the tree has any exposed vascular system where the bark is missing the fungi will penetrate causing severe damage to the trees overall health. This is easily combatted through simple tree injections and the removing of the fungi physically. Systemic deep root feed in the soil is also a great way to treat the disease. Updated on December 11, 2018, at 3:39 PM by Metroplex Arbor Care. Weatherford, Azle, Mansfield, Bedford, Benbrook, Blue Mound, Burleson, Colleyville, Crowley, Dalworthington Gardens, Edgecliff Valley, Euless, Hurst, Bedford, Everman, Flower Mound, Forest Hill, Fort Worth, Grapevine, Haltom City, Haslet, Hurst, Keller, Kennedale, Lake Worth, Lakeside, Newark, North Richland Hills, Pantego, Pelican Bay, Rendon, Richland Hills, River Oaks, Saginaw, Sansom Park, South Lake, Trophy Club, Watauga, Westlake, Westover Hills, White Settlement, Joshua, Alvarado, Rivercrest, Keller. *We have ISA Certified Arborist.